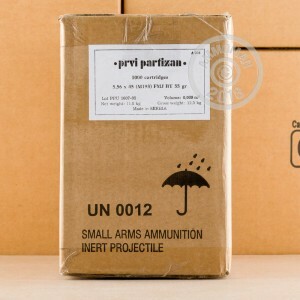 Serbian ammo manufacturer Prvi Partizan is one of the Balkans' largest ammo exporters. In business since the 1920s, it produces ammo to Western standards with non-corrosive Boxer primers and reloadable brass cases. 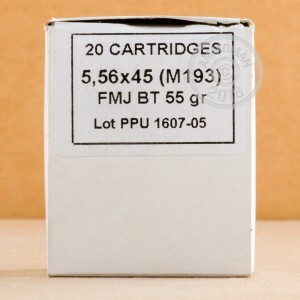 This 1,000 round case (50 boxes with 20 rounds each) of 5.56x45mm ammo is a great example, and will work great in your AR-15 or other 5.56 caliber rifle. These cartridges use a 55 grain full metal jacket bullet loaded to produce ballistics similar to M193 ball ammo. Prvi Partizan (also known as PPU, with the "U" standing for its hometown of Uzice, Serbia) gets its unusual moniker from its history of supplying "partisan" forces resisting Nazi occupation during World War II. The name was given during a period of government control, but has stuck even since then, perhaps due to the brand's name recognition and good reputation for providing quality at an affordable price. 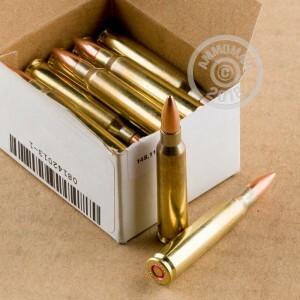 Buy $99 or more of ammo from AmmoMan to get free shipping. This offer applies whether you buy $99 worth of ammo or $500 or more, so stock up and save! Great price and great rounds. I have been using PRVI PARTIZAN rounds for about 5 years in my Mosin Nagant. Thought I would give their 5.56 rounds a try. Very glad I did. Very nice rounds! Super quick shipping.Have used PPU for years.Always quality stuff with great price. Ammoman has always done it better than the rest.My last purchase of 7.62x51 came in three days. Ammoman Is the only place I'll buy from. Quick shipment and shot over 300 rounds so far with no issues. Competitive prices. Will continue as my supplier. Everyone knows Prvi 5.56 is great stuff... But Ammoman's great prices, FAST shipping, and exceptional selection is why I buy my ammo here. Always goes bang and no problems at all. Love the fact that they're sealed in 200 round packs (10 boxes of 20 rounds) which makes them pretty easy to take shooting, and no need to worry about long term storage. No issues whatsoever with this ammo. Always dependable with well over 5k rounds shot.